Today's blog post is dedicated to all sisters who are self-deprecating and who just can't let it go...Sadly, everyone in my family loves to take pictures, which means I will be haunted till my dying days by closed eye freeze framed mid-sentence fright faces, poorly timed flash, and bad fashion history. This is an exact transcription of a conversation I had with my sister over her posting of the picture seen below of Cherdo (left) and Sister D (right). Cherdo: Oh, geez. Now I have to blog [about bad pictures] again. Cherdo: Yes, to create toddler girdles. Sister D: Did we have worms or something? Sister D: Overfeed those children! Cherdo: I was dragging you to the chow line. Sister D: Bloated bellied starving children. Sister D: At least you didn't have to wear the dumb bathing suit. Cherdo: Yeah, those braids covered all my figure flaws...NOT. Sister D: My head looks like a melon. Sister D: I ALWAYS wear socks to the pool. Cherdo: Why am I smiling? What do I have to smile about? I'm standing in weeds and my toddler cellulite is chaffing my inner sausage-legs. Cherdo: And I don't have glasses on, so I can't even see my own humiliation. Sister D: Someone said "ice Cream"? Sister D: At least you could get your legs together. I clearly could not. Cherdo: I need to put a caption over my head, "Hey, more food over there! Come on, Sister D!" All you sisters out there have a good weekend. Hi, Cherdo! Sista Shady here. Hey, all I see in the picture you posted here today are two cute, adorable little ladies, one of them my dear future friend Cherdo aka Miss Congeniality. So this is goodbye for now, dear Cherdo. I hope you stay well and don't use up all your A material while I'm gone. God willing I will be back to resume our wonderful friendship three weeks from now. Take care, dear friend Cherdo! Ah, Shady, you are the sweetest. I'll try not to use up all my crazy before you return if you promise to have a fantastic time, create new crazy memories and give me the crying Santa photo, 8x10 sized please. You are officially the fourth sistah in the family, and if I can find that suit - it would look darling on you. Goodbye - but only for three weeks! Remember the sunblock and party on. Those are bathing suits? What kind of torturers were your parents? Probably very similar to mine. I have a sisters' bad photo story. I have lots of them, but I'll tell only one. A sister finally gets around to getting married. A photo is taken of the bride and her sisters at the wedding. At the moment the photo is taken, the youngest sister, moi, steps forward and opens her mouth to ask a question. Thus, the photo is of everyone else looking pretty normal and me with my mouth open, out in front of everyone else. And that was the photo. What photographer only takes one shot and doesn't redo it when the idiot youngest sister has her mouth open? 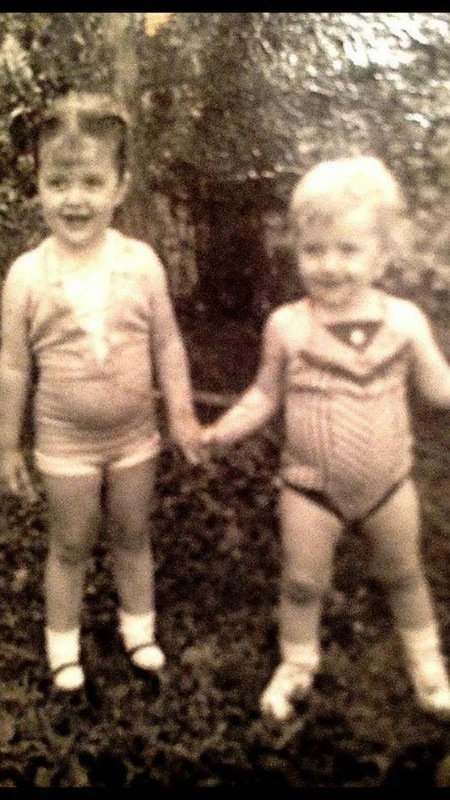 Actually, I don't think they are bathing suits - early 60s, this would be your basic toddler wear, I'm sure. The "youngest sister" tale is a hoot! Bwahahahahaha. I was a toddler during the early sixties. I haven't seen any pictures of myself dressed that way. Of course, I don't think many photos of me as a toddler exist because I was #6 and my mom just didn't give a damn anymore. I probably ran around naked. I've noticed chubby babies are the CUTEST!!! You guys look adorable.